It is very important to introduce your pup to all sorts of new situations from a young age. Socialization to a wide variety of people, places, objects, and animals is probably the #1 thing an owner can do to create a stable and happy companion. A dog that has been exposed regularly to such a variety of experiences will learn to take everything in stride and won’t overreact out of fear or nervousness. As breeders we do our best to give our pups a good start in this area. The pups are handled daily from the time they are born (weighing, clipping nails, cuddling;) they are raised in our home in the midst of the normal ‘house noises’ such as other dogs barking, people talking, TV noise, pots banging in the kitchen; we allow and encourage people to visit with the pups so they get used to different people; and we provide them with a variety of toys to stimulate their curiosity. Socialization, however, is not a short-term thing, but rather is a constant process. Early socialization can be lost if the pup goes from the breeder’s home to the owner’s home and subsequently is kept in isolation, rarely taken out of the home or yard. For young pups that have not yet received their full set of vaccinations, concerns about exposure to disease are certainly valid, however you should NOT delay socialization until after the 3rd set of shots because of this. The age from 9-16 weeks is an extremely important time in a pup’s development, and if socialization is not continued during this time the pup may never recover. Socialization during this stage should proceed with a bit of caution and common sense – a walk in the park where dozens of other strange dogs are regularly walked would not be a good idea, for instance, but visits to friends’ homes (and inviting friends, and their kids, to visit you,) allowing interaction with friends’ dogs which you know are up to date on immunization (and who will be good with a pup,) rides in the car, and carrying the pup while visiting an area that might be of some concern, such as a trip to an outdoor farmer’s market, are all ways a pup can be safely exposed to new situations. A good puppy kindergarten class is also a worthwhile investment, and most will accept pups over 3 months of age. It has been said that sadly the lives of more dogs are lost due to temperament problems stemming from lack of early socialization, than are lost to diseases contracted from being taken to public places. 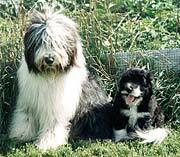 The importance of socialization, especially in a sensitive breed like a Beardie, can not be overemphasized. 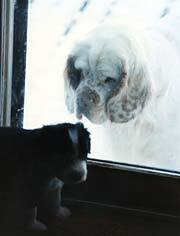 In socializing your pup, there will be times when something new may frighten him. Also, during certain 'fear periods' of a pup's development, something previously accepted may suddenly elicit a nervous reaction. Your own reaction during these times is very important. Coddling, or 'protecting' the pup from the scary thing only serves to reinforce his fear and convince him there IS something to be wary of. Instead, lots of treats, much happy talk, engaging in play, and encouraging investigation can usually turn his attitude around.